The pictures below shows the result of this tutorial. 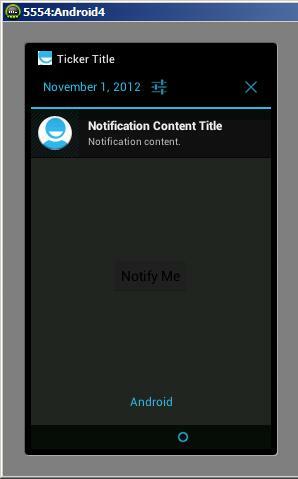 When the user clicks the “Notify Me” button a notification pops up showing various text parameters specified by the programmer. For the app’s GUI a simple button will suffice. Here is the activity’s code. Scroll below for an explanation. The notification class requires an intent, this is done with the following lines of code. Using the new “Notification.Builder” method a notification object is made. This is where we specify the ticker text, notification title, content, and icon to be displayed. There are many more options available, check them out! The notification flags control the behavior of the notification, for example do you want your phone to flash when a notification is called? In our case the only flag I used was auto cancel flag which closes the notification when the user clicks it, yes, if we did not have this flag the notification would not close, it’s weird that this isn’t default right? Lastly, using the notification manager we call the notification. The first parameter of the notificationManger.notify method is a unique ID for the notification within your application, the second parameter is the notification object we created using the builder method.